Sinister forces are behind the blowing up of wells in an attempt to gain control of key oil fields. Moto is assigned by British-based Beta Oil Corporation and the Foreign Office to discover who is conspiring to control the oil leases of the petroleum-rich emirate of Wadi Shammar. 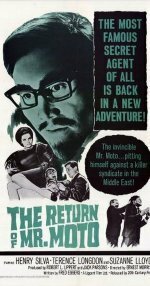 After an attempt on his life fails, Moto goes undercover disguised as a Japanese businessman discovers a plot against the life of the Shahrdar of Wadi Shammar. Moto is aided in his efforts by beautiful Beta Oil secretary Maxine Powell and Police Inspector Jim Halliday.